The recognition of human movements is an important topic in computer vision and has many promising applications in entertainment, human computer interaction, automatic video indexing, video surveillance and intrusion detection. An important requirement is speed. Especially for interactive applications, real-time recognition rates are needed. In applications like computer games or human computer interactions, the user should not perceive any noticeable delay between the action performed and the system response. a movement is a curve in the (normalized) model parameter space, and these curves are characteristic of the type of action performed. Comparing the whole curves for recognizing actions does not seem to be a good idea, for instance because the same action can have different lengths, but we can extract small segments of curves and use them for comparison. In our idea these segments, called sequences, are still characteristics of the kind of action performed. Using sequences allows for an on line recognition, necessary in several applications, since we do not need to acquire and process the whole motion to classify it. 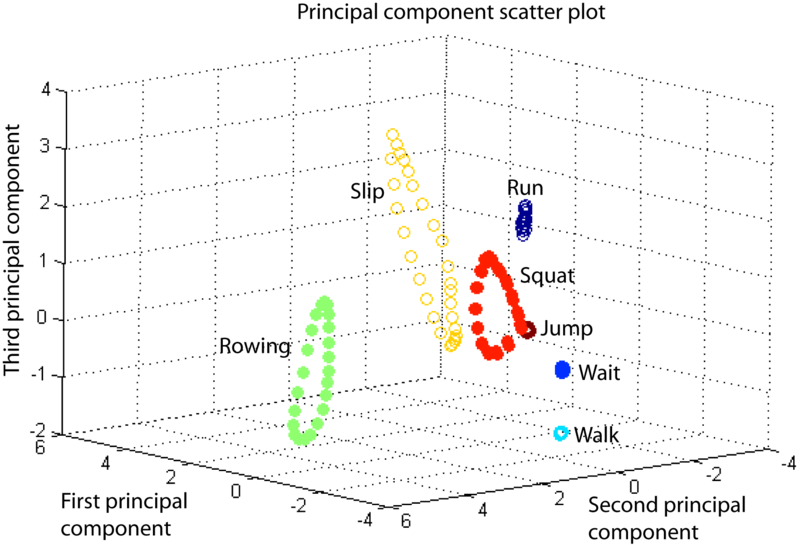 Exploiting Principal Component Analysis (PCA), a reduced dimensionality model of the sequences can be used to recognize several basic actions, like walking, running or waiting. The contribution of this work is a system that, after a proper training, is capable of recognizing many different action classes in real time. Furthermore, the approach can be easily extended to deal with other motion classes. The proposed method exploits 3D motion data, since 2D techniques often impose constraints on the characteristics of the motion to be analysed and of the available data.